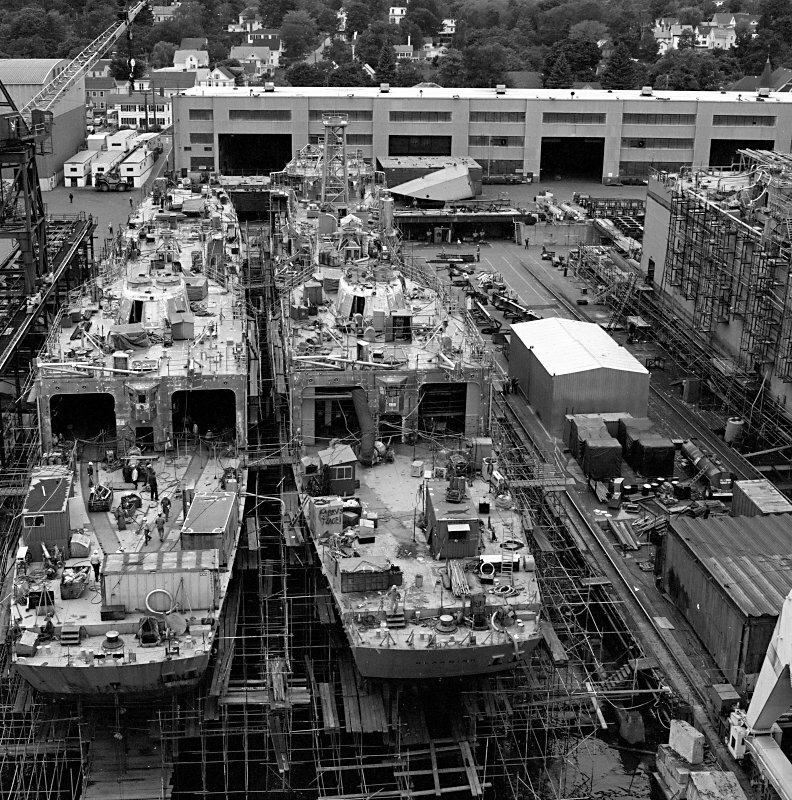 27 April 1979: Building contract awarded to the Bath Iron Works Corp.
19 February 1982: Keel laid by the Bath Iron Works Corp., Bath, Me. 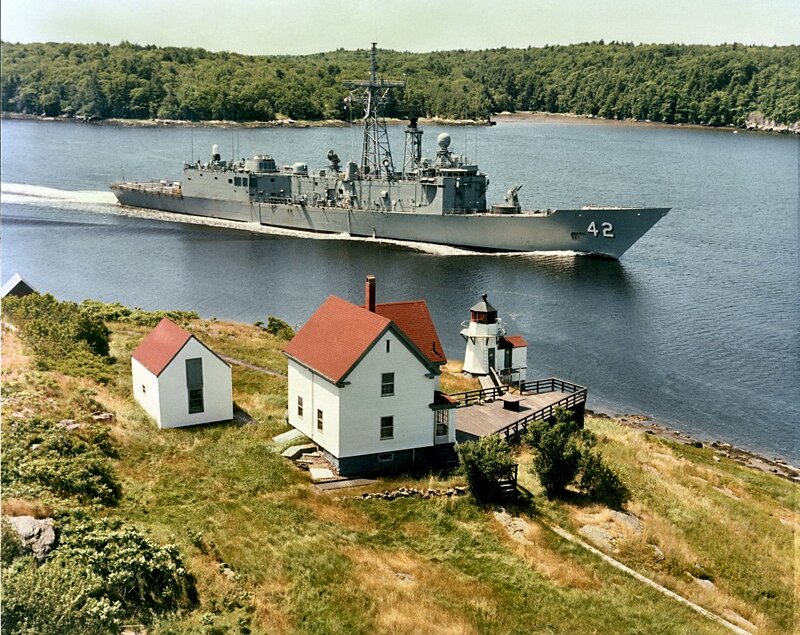 10 January 1983: Precommissioning Unit Klakring established at Fleet Training Unit, Norfolk, Va.
20 August 1983: Commissioned at Bath, Cmdr. 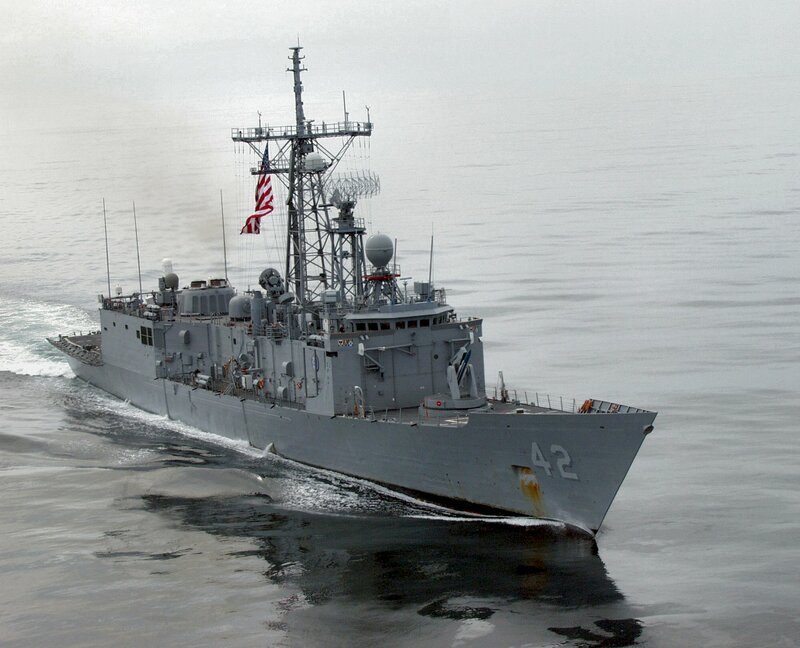 Leonard O. Wahlig in command, assigned to Destroyer Squadron 6 at Charleston, S.C.
01 October 2002: Assigned to Naval Reserve Force, Atlantic at Mayport, Fla.
"Klakring, The Ship" - "Klakring, The People"
68k Born in Annapolis, Maryland on 19 December 1904, as the only child of Colonel and Mrs. Leslie Klakring, he entered the Naval Academy from the State of Connecticut, and graduated with the Class of 1927. A submarine hero of the Pacific War in World War II, Admiral Klakring was credited with sinking eight Japanese ships within sight of Japanese ports, after taking his submarine, USS Guardfish, into Japanese water previously un-patrolled by American submarines. 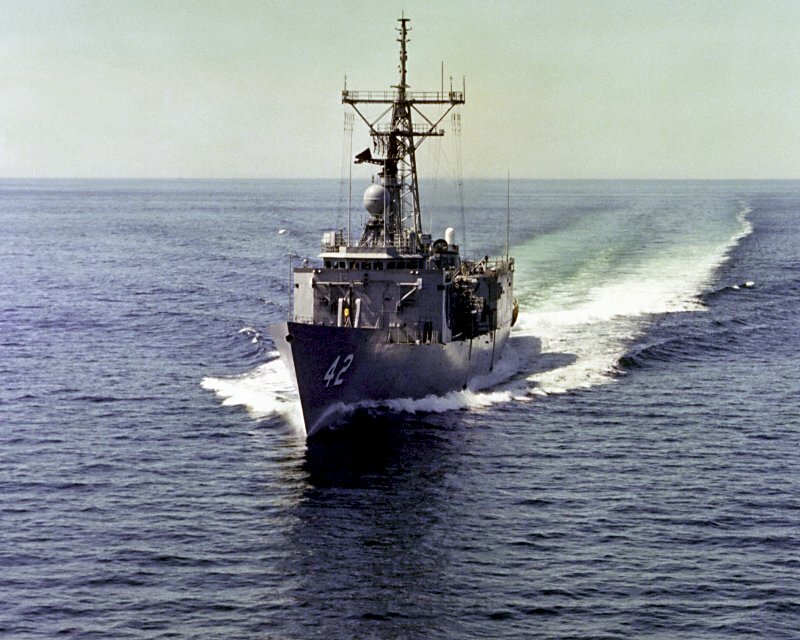 Without the benefit of sophisticated SONAR, Guardfish sighted, or torpedoed, 77 enemy vessels in about 35 days, during one of her war patrols. 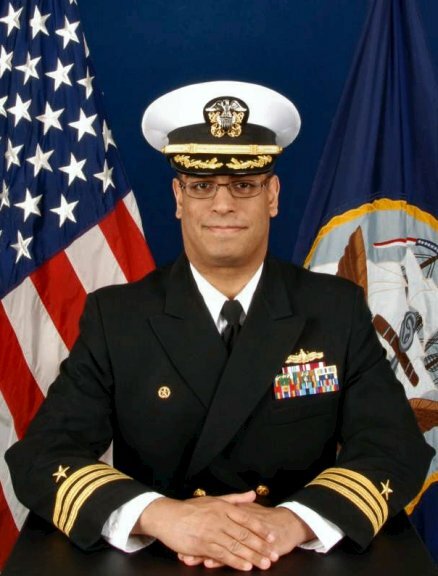 Then Lcdr. Klakring commanded Guardfish from 1941 to 1943. While under Lcdr Klakring's command, Guardfish chalked up an impressive record. She left on her first war patrol on 6 August 1942 for the eastern shore of Honshu, and sent eight enemy ships, totaling 51,055 tons, to the bottom, and damaged a 7,000 ton freighter. In October, during her second war patrol, Guardfish sank another freighter and a tanker, and damaged another freighter in the East China Sea. On Guardfish's third war patrol, in the Rabaul-Kavieng area, additional Japanese shipping was sunk, including two naval vessels. 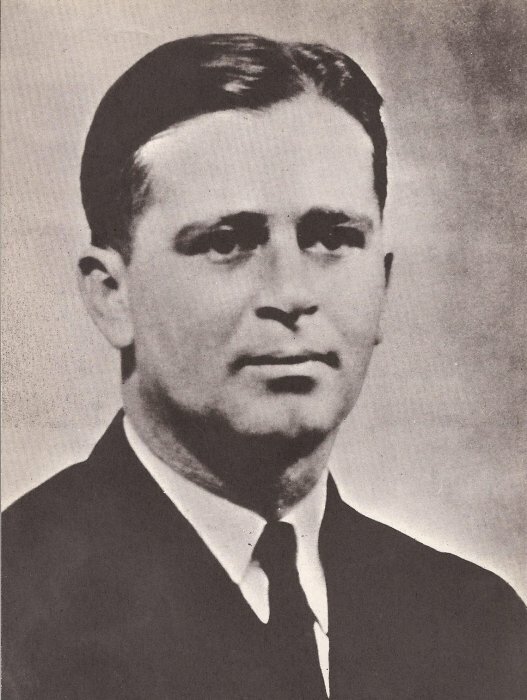 For his heroism while commanding Guardfish, Klakring was awarded the Navy Cross with two Gold Stars (in lieu of second and third awards). In addition, Guardfish was awarded the Presidential Unit Citation while under Klakring's command. Admiral Klakring's other decorations include the Silver Star, Bronze Star (both for heroism during World War II), China Service Medal, American Defense Service Medal, American Area Campaign Medal, Asiatic-Pacific Area Campaign Medal, and the World War II Victory Medal. 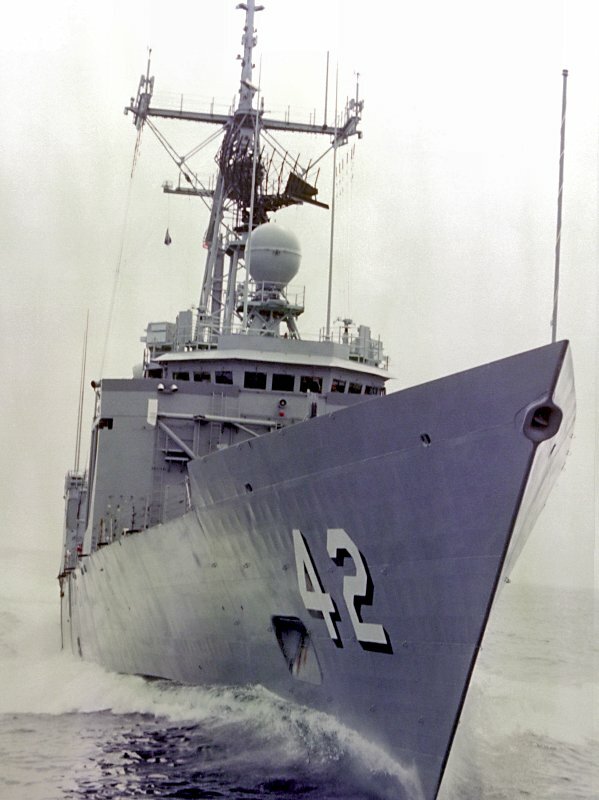 USS Klakring (FFG 42) was the first ship to be named in his honor. 118k 19 February 1982: Bath, Me. 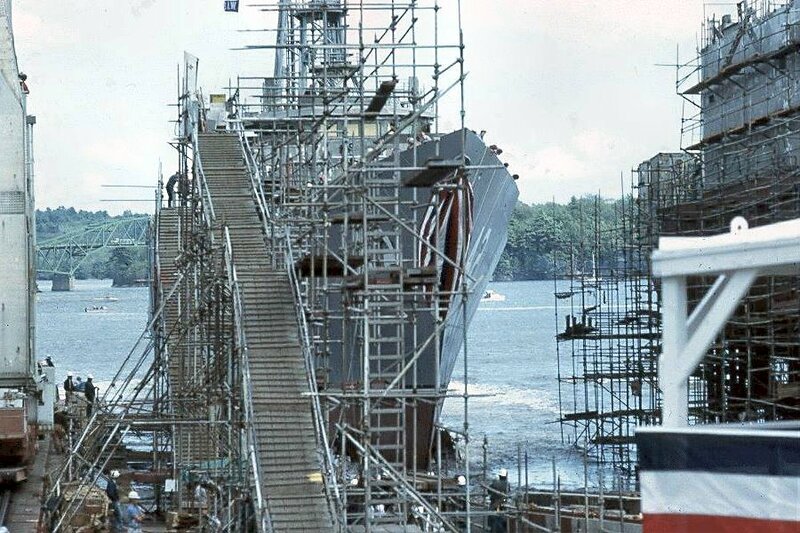 - A view of the keel of the guided missile frigate Klakring. 115k 19 February 1982: Bath, Me. 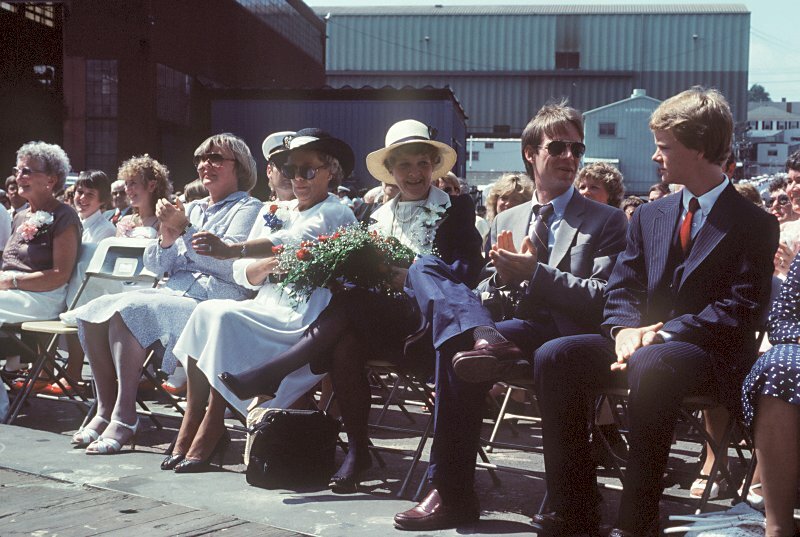 - Guests pose for a photo during the keel laying of Klakring. 236k 01 September 1982: Bath, Me. - A stern view of Klakring at 60 percent completion. 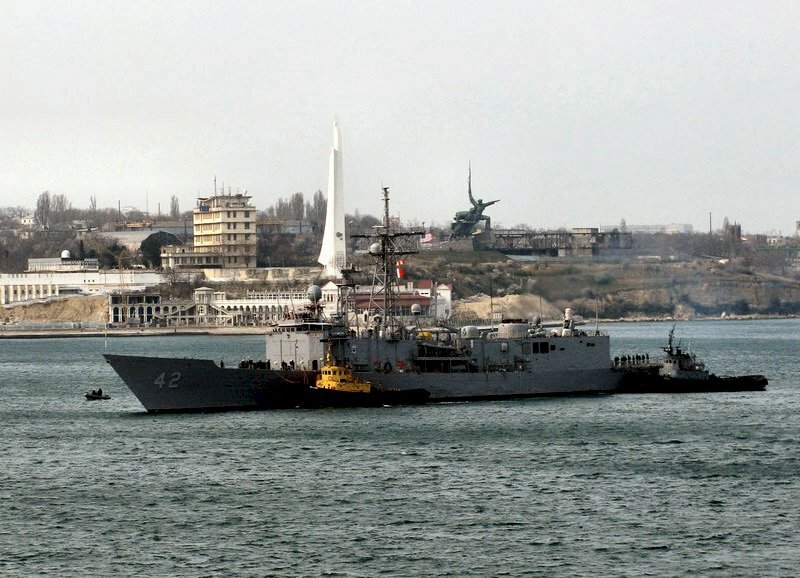 The guided missile frigate De Wert (FFG 45) is on the left. 124k 18 September 1982: Bath, Me. 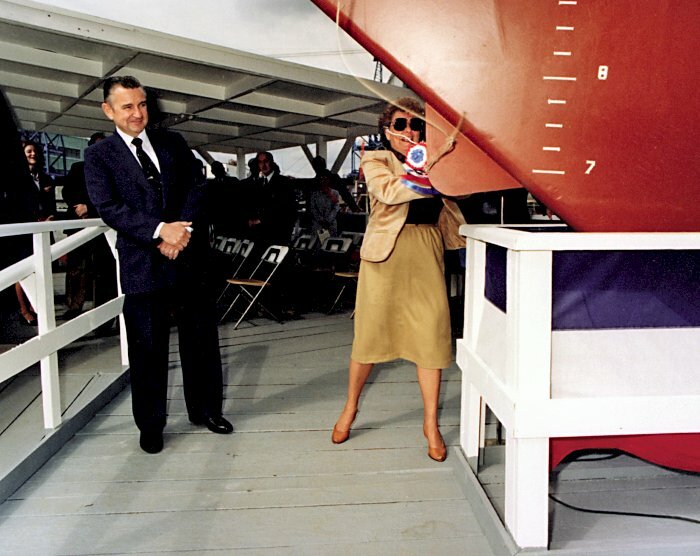 - Two shots of Klakring decorated for her launching. 87k 18 September 1982: Bath, Me. - Guests begin arriving for Klakring�s launch and christening. 106k 18 September 1982: Bath, Me. - Beverly Bohen, niece of Radm. 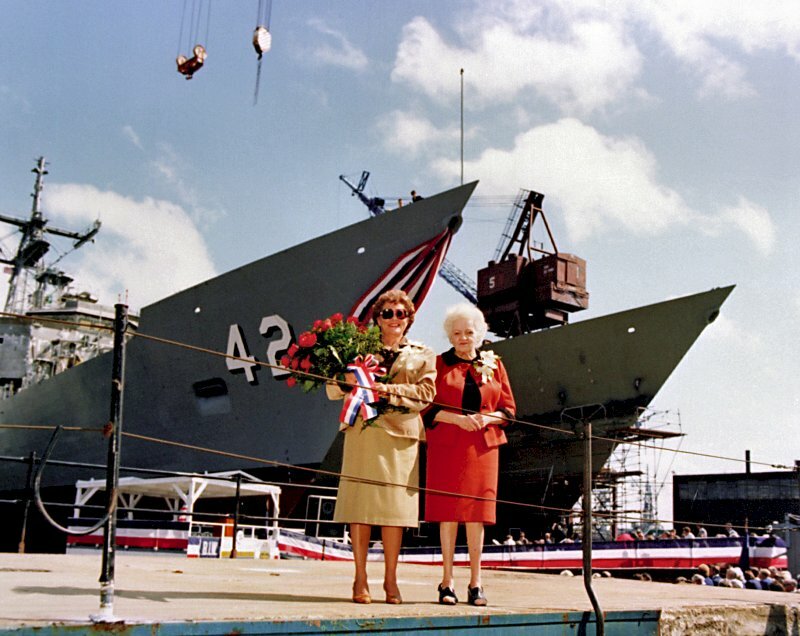 Thomas B. Klakring, and ship�s sponsor, left, and Susan Quick Cahoon, matron of honor, pose in front of Klakring prior to the ship's launching. Mrs. Cahoon has decorated the christening bottles for launches at Bath Iron Works for over 35 years. 81k 18 September 1982: Bath, Me. - Beverly Bohen, sponsor and niece of Radm. 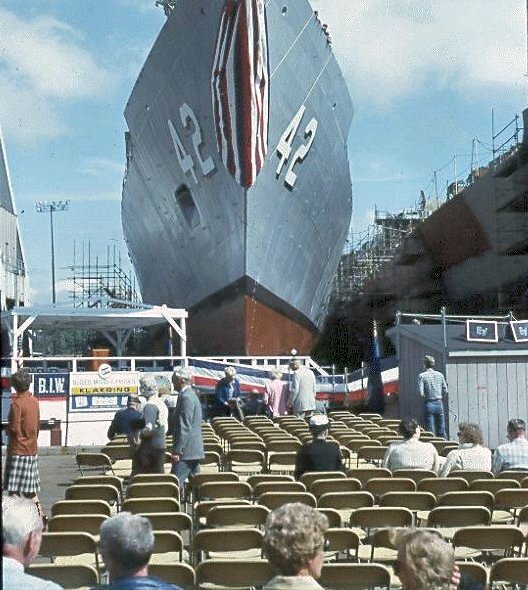 Thomas B. Klakring, christens Klakring (FFG42). John F. Sullivan, Jr., president of Bath Iron Works watches. 85k 18 September 1982: Bath, Me. - A starboard bow view of Klakring assisted by tugs shortly after being launched. 148k 14 October 1982: Bath, Me. 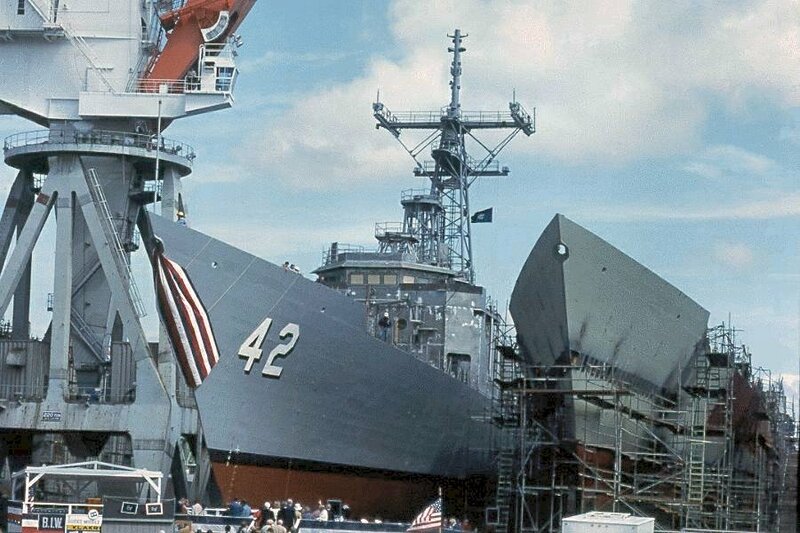 - The starboard bow view of guided missile frigates Klakring (FFG 42), Doyle (FFG 39) and Underwood (FFG 36) under construction. 145k 28 June 1983: Bath, Me. - A starboard bow view of Klakring heading to sea for trials. 115k 28 June 1983: Atlantic Ocean - An elevated port bow view of Klakring underway. 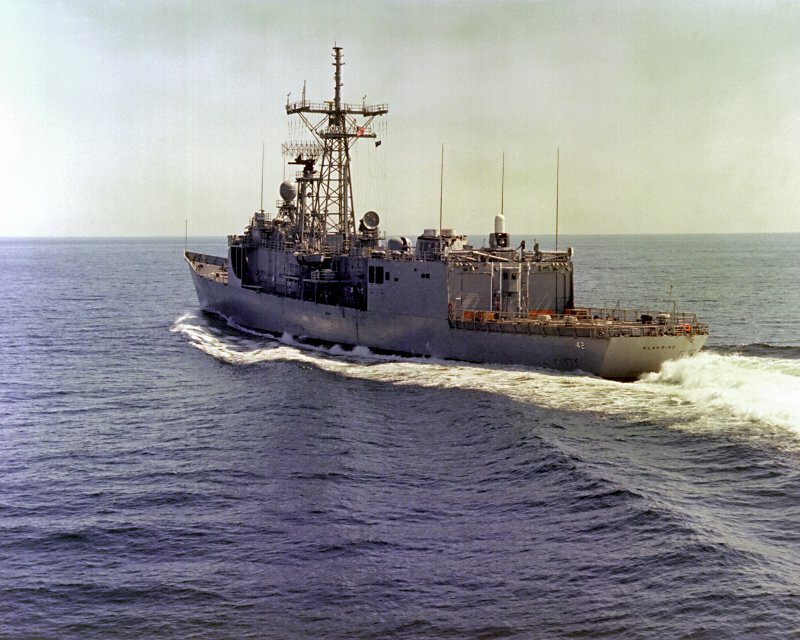 71k 28 June 1983: Atlantic Ocean - A close in starboard bow view of Klakring underway. 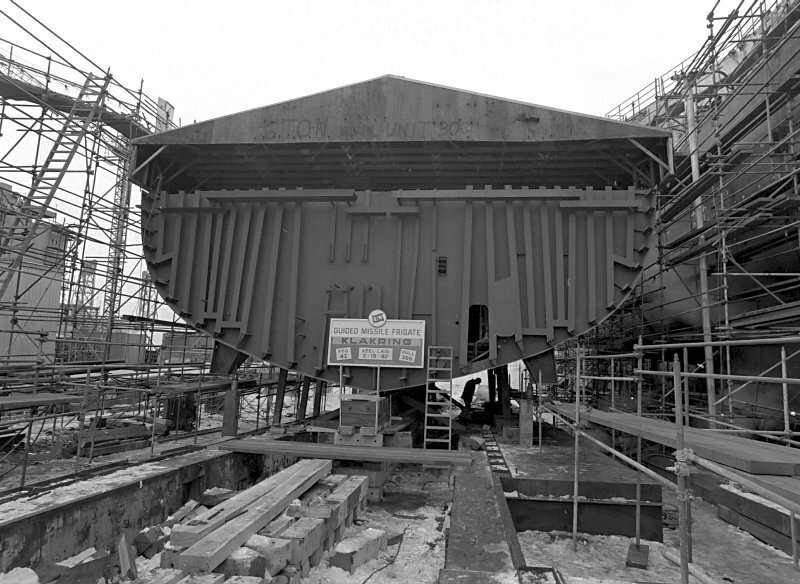 174k 28 June 1983: Atlantic Ocean - An elevated port quarter view of Klakring underway. 109k 28 June 1983: Atlantic Ocean - A port quarter view of Klakring underway. 269k 28 June 1983: Bath, Me. - A starboard bow view of Klakring underway on the Kennebec River returning to Bath. 110k 20 August 1983: Bath, Me. 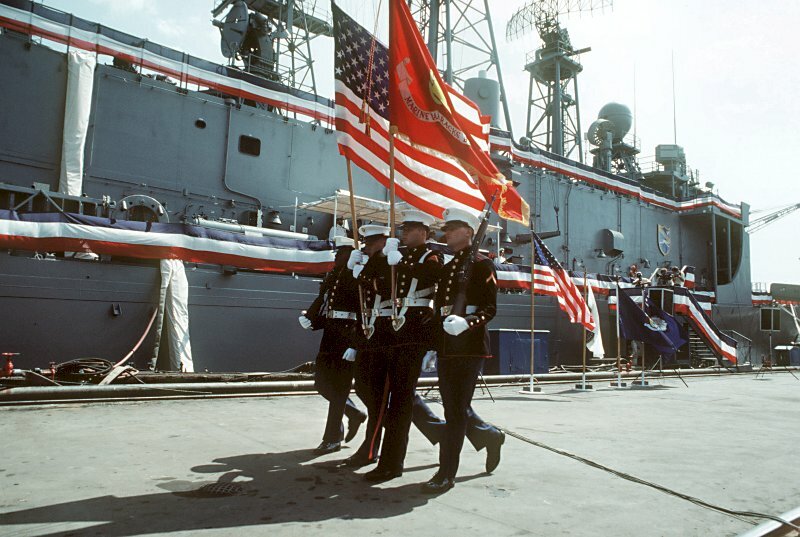 - A US Marine Corps color guard parades the colors during the commissioning of the guided missile frigate USS Klakring (FFG 42). 102k 20 August 1983: Bath, Me. 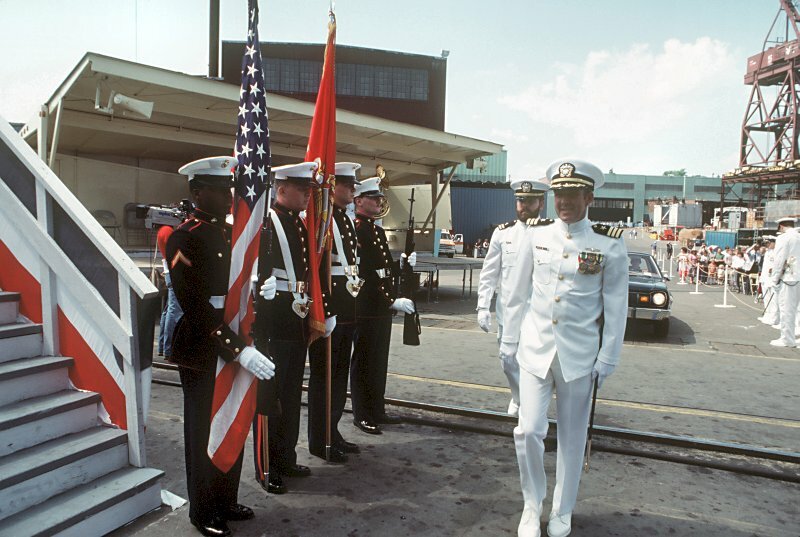 - Cdr Leonard O. Wahlig, prospective commanding officer of Klakring, passes a Marine Corps color guard upon his arrival for the ship's commissioning. 112k 20 August 1983: Bath, Me. - Sponsor Beverly Bohen holds a bouquet while attending the commissioning of Klakring. Mrs. Bohen is the niece of Radm. Thomas B. Klakring, for whom the ship was named. 66k 20 August 1983: Bath, Me. 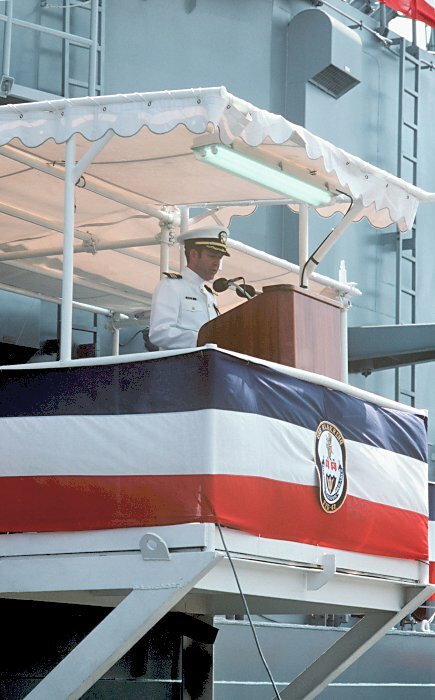 - Commander Leonard O. Wahlig, prospective commanding officer of Klakring, speaks during the ship's commissioning. 119k 20 August 1983: Bath, Me. 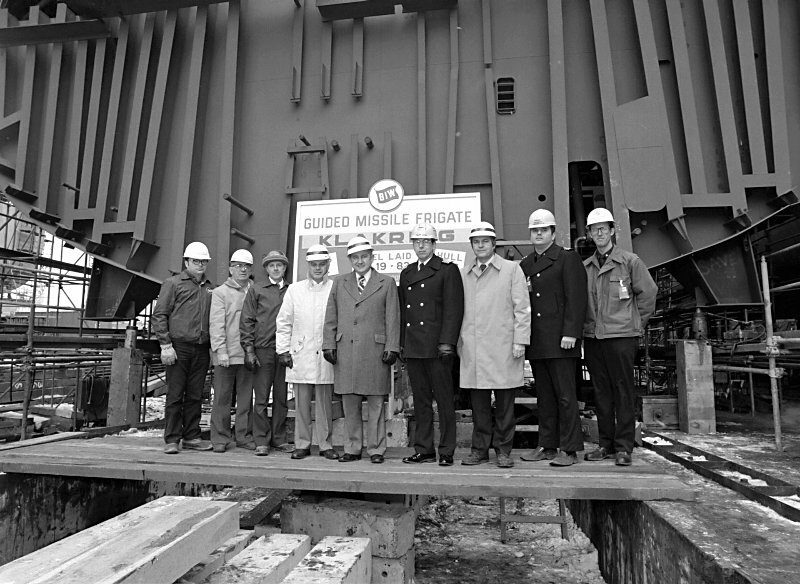 - Crew members stand at parade rest during the commissioning of Klakring. 124k 20 August 1983: Bath, Me. 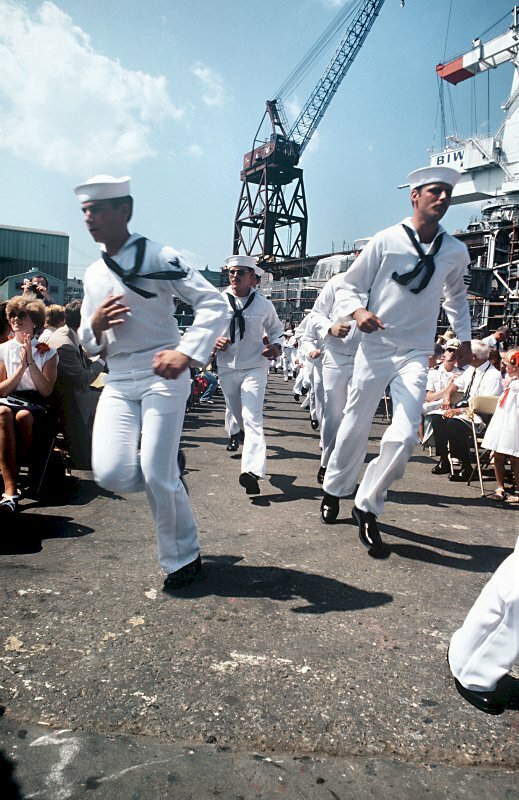 - Crew members run to board Klakring during the ship's commissioning. 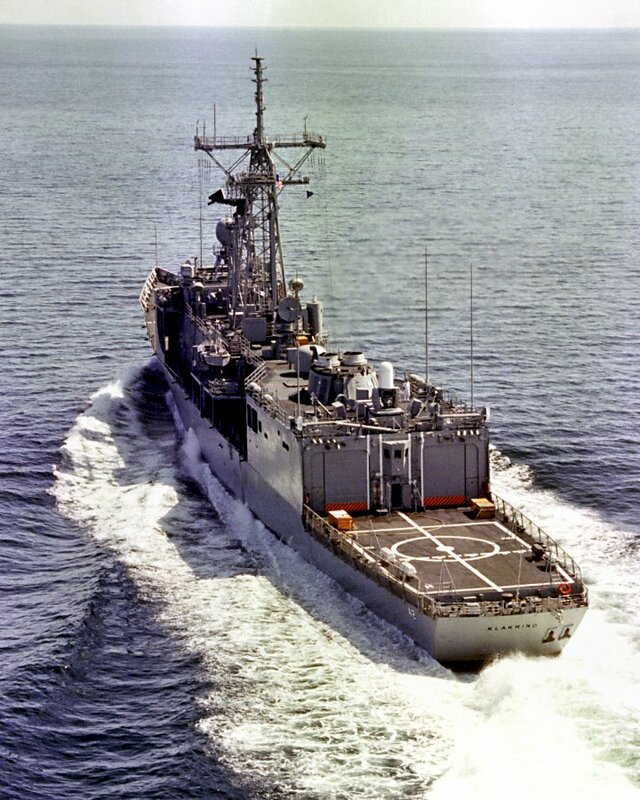 84k 27 February 1994: Mayport, Fla. - A port bow view of Klakring moored out board of the guided missile cruiser USS Philippine Sea (CG 58) at Naval Station Mayport. 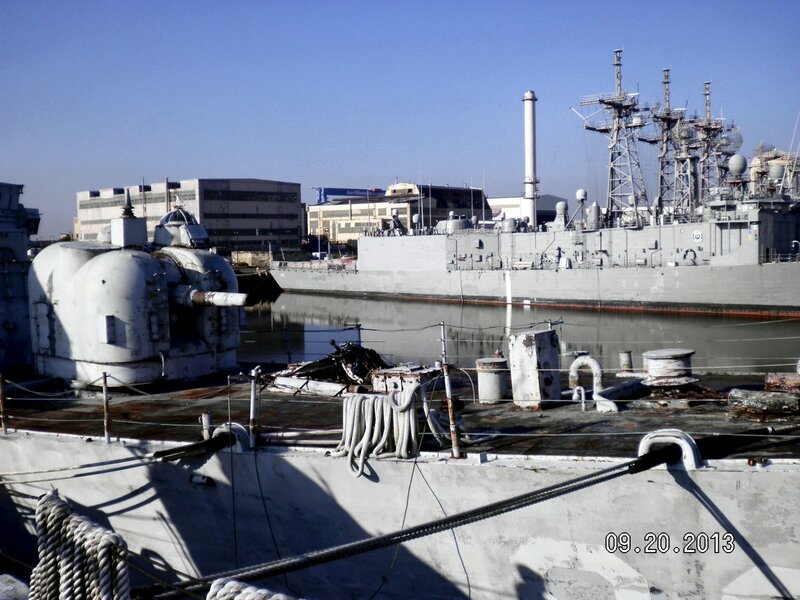 An unidentified Ticonderoga class guided missile cruiser is in the background. 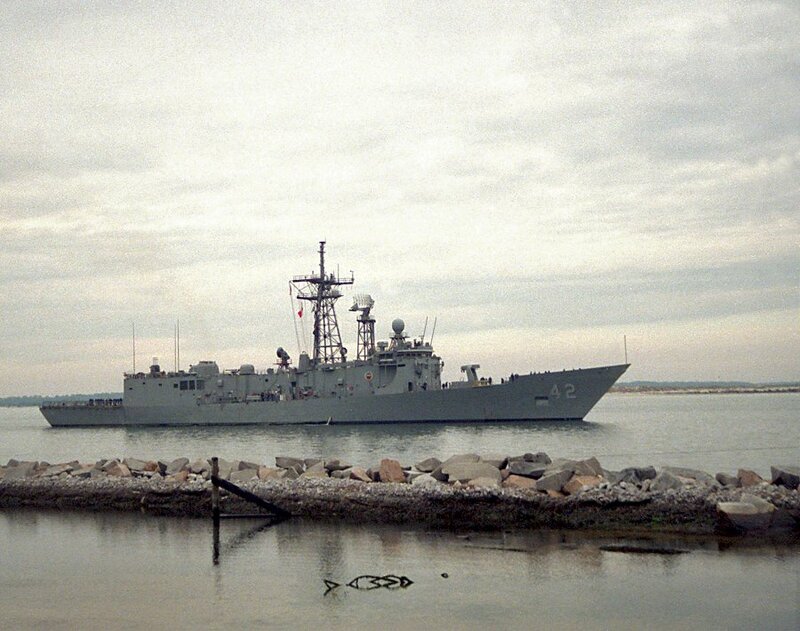 136k 27 February 1994: Mayport, Fla. - A starboard side view of Klakring putting out to sea on the evening tide from the Mayport Naval Station. 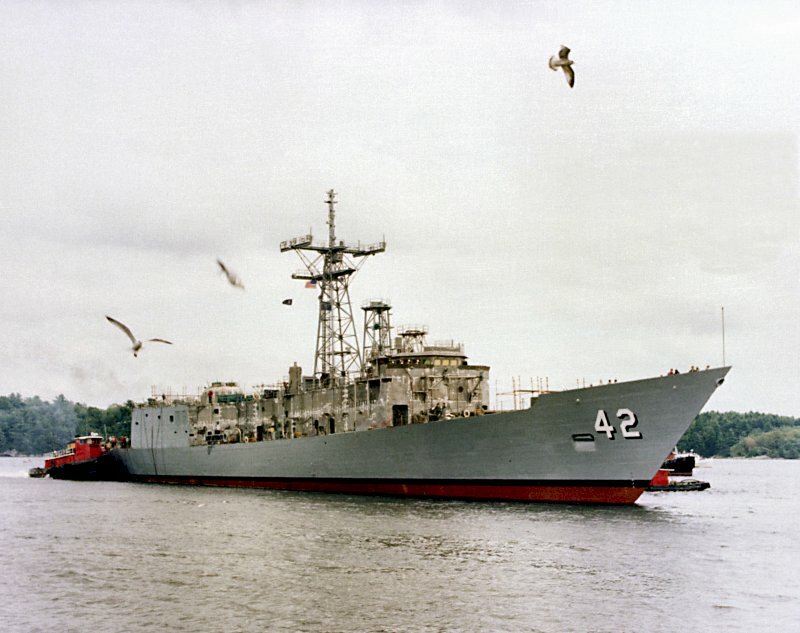 118k 24 August 1994: The Caribbean Sea, Operation Sea Signal - USS Klakring (FFG 42) from Charleston, S.C. transports Cubans, who were picked up at sea, to the Naval Base at Guantanamo Bay. 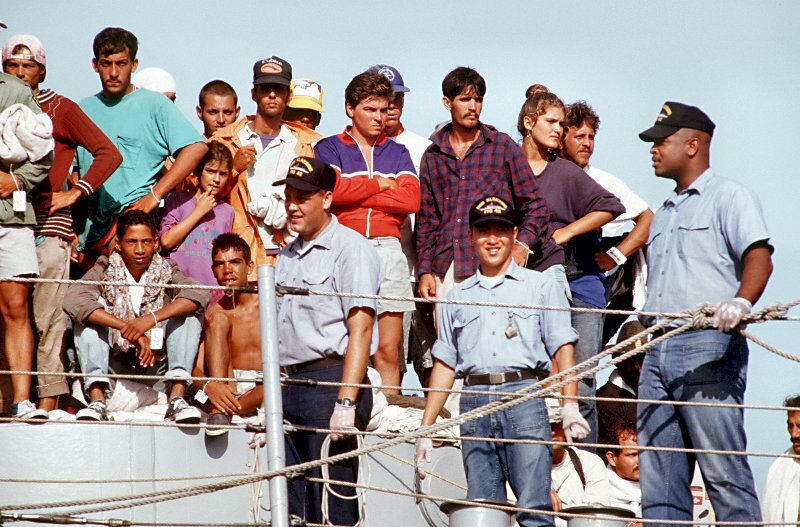 After entering the Naval Base the Cubans will begin processing for safe haven. 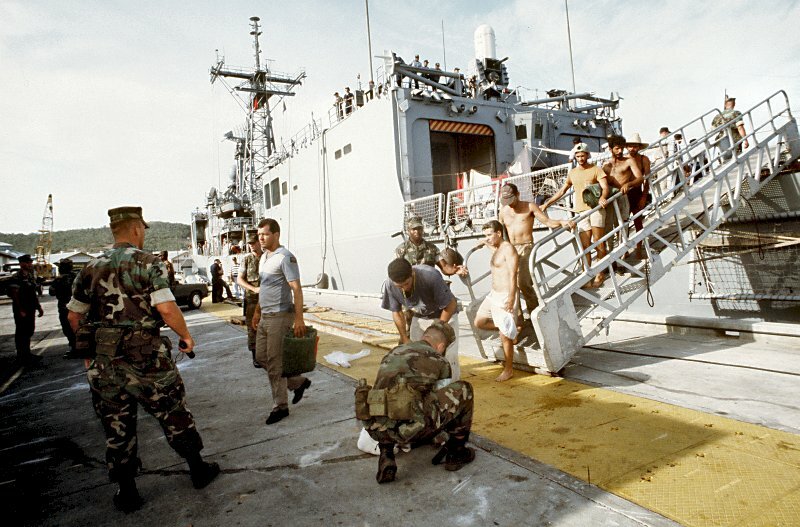 126k 24 August 1994: Guantanamo Bay, Cuba, Operation Sea Signal - A close-up view of some of the Cubans who were picked up at sea, and three navy personnel standing at the ropes. Klakring is transporting them to the Naval Base. 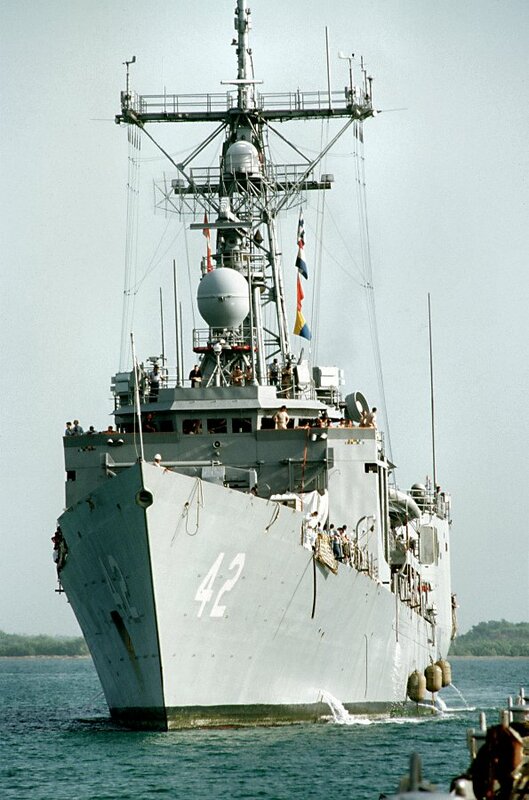 118k 24 August 1994: Guantanamo Bay, Cuba, Operation Sea Signal - Cubans who have been picked up at sea are being searched before being allowed to enter the safe haven camps. They are disembarking Klakring. 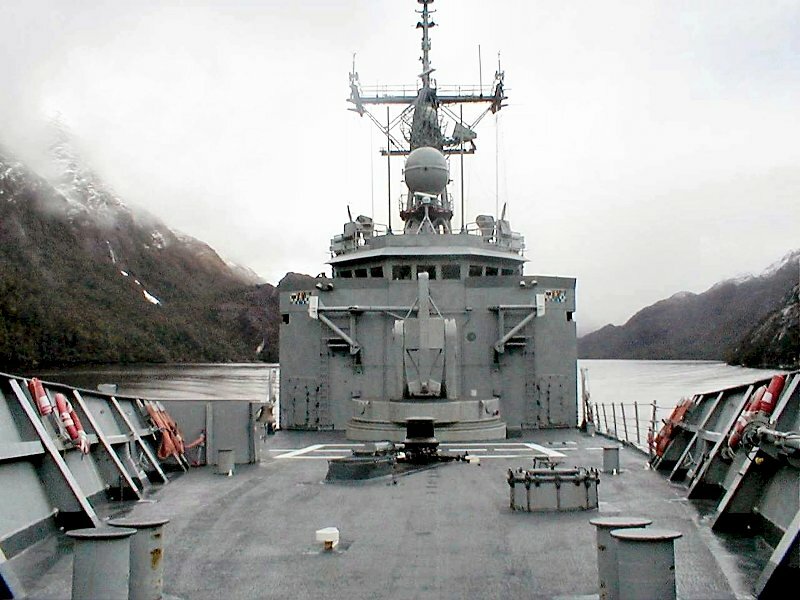 94k 30 September 2000: The Straits of Magellan - While on UNITAS 2000 Klakring navigates the tight canyons and fjords of the Inter-Chilean Waterway while transiting from Valparaiso, Chile to Argentina, around the southern-most tip of South America. 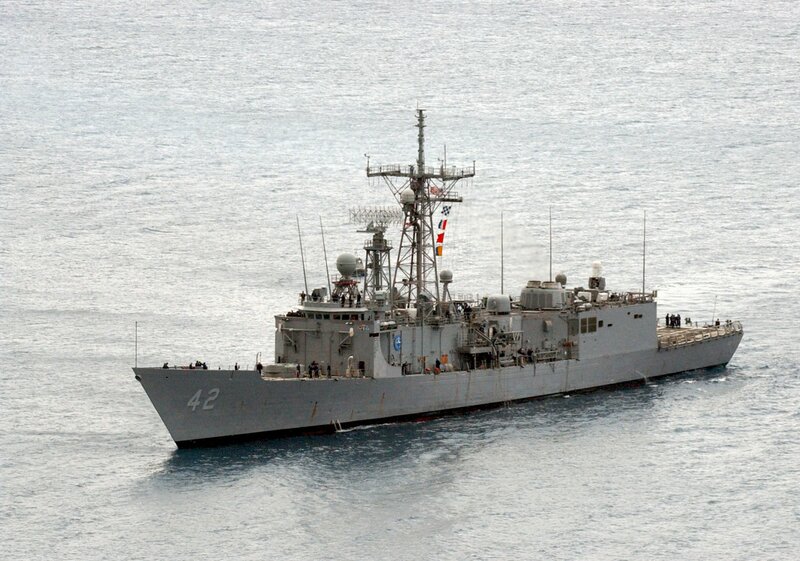 448k 25 June 2002: Eastern Pacific - The U.S. Navy guided missile frigate USS Klakring (FFG 42) is one of two U.S. Navy ships participating in the Pacific Phase of UNITAS 2002, scheduled between 27 June and 11 July 2002, along the Eastern coast of South America. 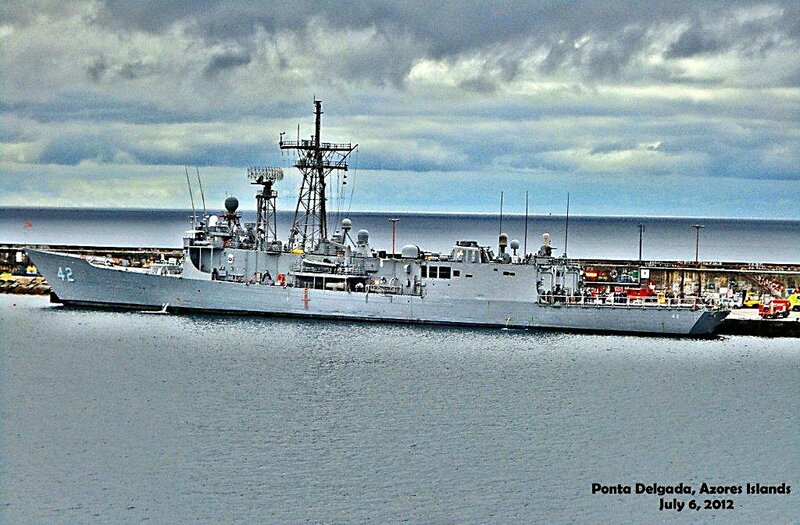 14 ships from five countries will rendezvous at the Chilean Navy Base in Coquimbo, Chile, to begin two weeks of intense multinational training exercises. 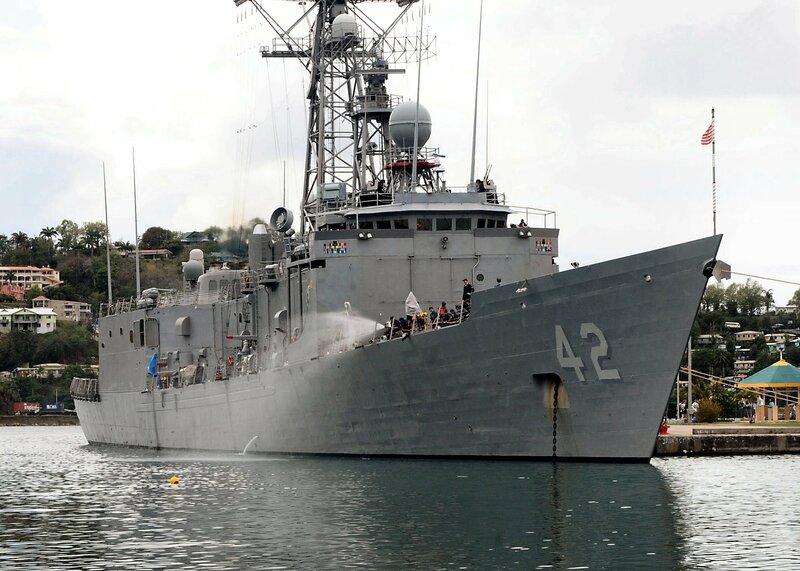 441k 03 July 2002: Off the coast of Chile - The guided missile frigate USS Klakring (FFG 42) leaves the port city of Coquimbo, Chile, to participate in the Pacific Phase of UNITAS 43-03. 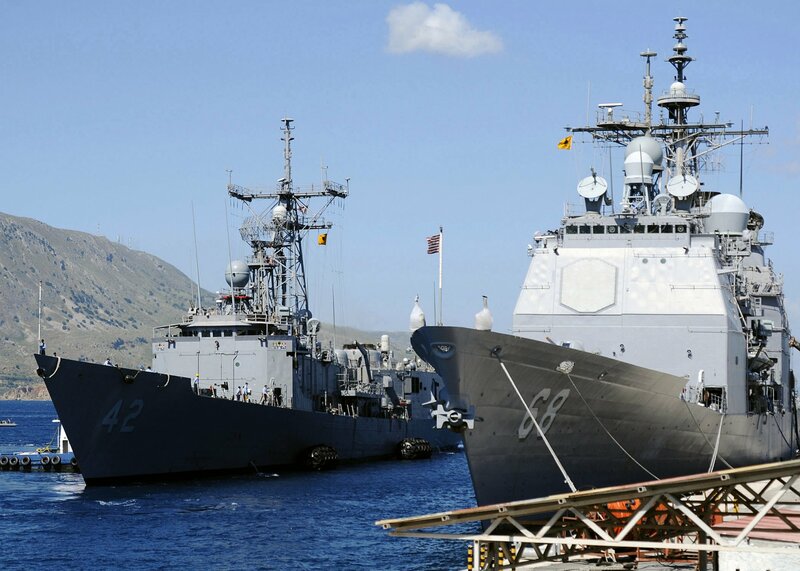 UNITAS (Latin for "unity") involves warships from six countries participating in ten days of intense wargames designed to build multinational coalitions while promoting hemispheric defense and mutual cooperation. 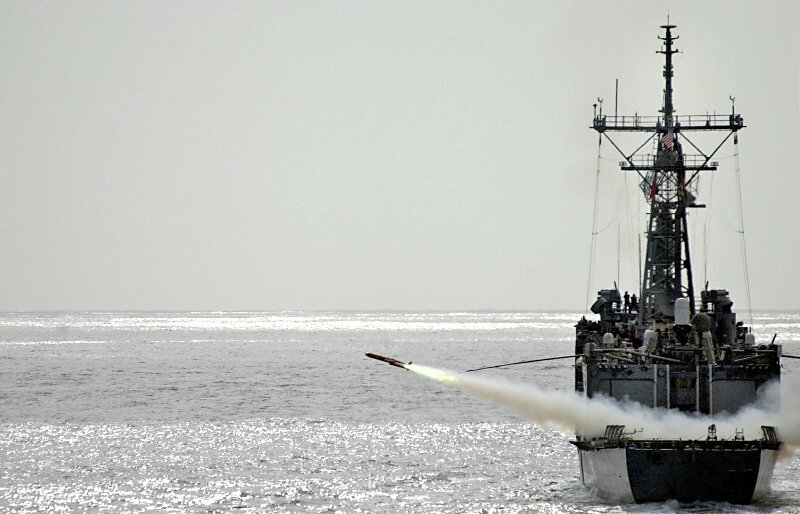 73k 05 July 2002: The Eastern Pacific Ocean - A BQM-64E drone is launched from the deck of Klakring during the Pacific Phase of UNITAS 43-03. 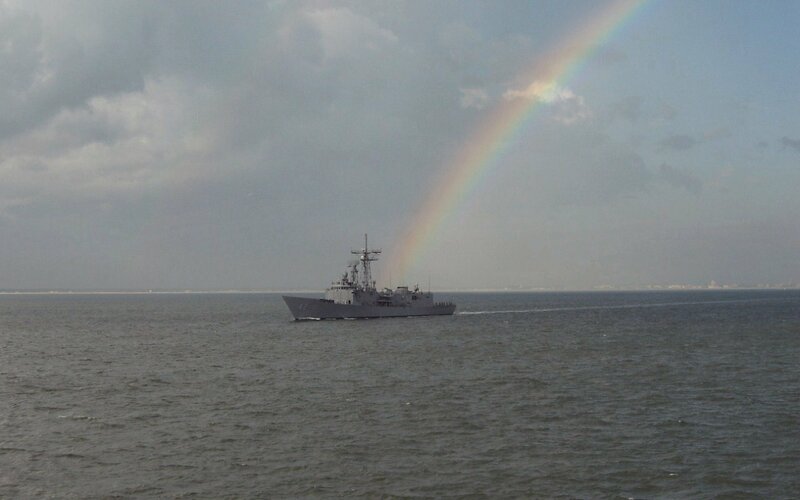 UNITAS (Latin for "unity") involves warships from six countries participating in ten days of intense war games designed to build multinational coalitions while promoting hemispheric defense and mutual cooperation. 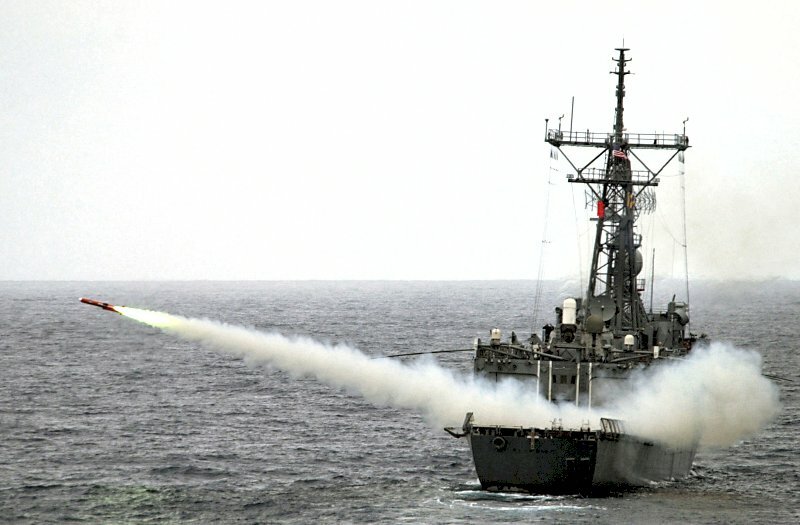 69k 05 July 2002: The Eastern Pacific Ocean - A BQM-64E drone is launched from the deck of Klakring during the Pacific Phase of UNITAS 43-03. 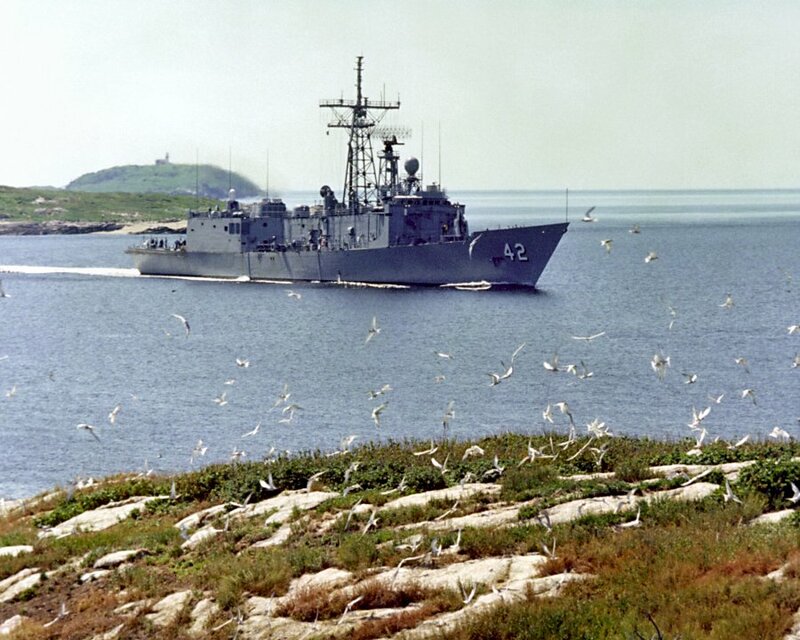 UNITAS (Latin for "unity") involves warships from six countries participating in ten days of intense war games designed to build multinational coalitions while promoting hemispheric defense and mutual cooperation. 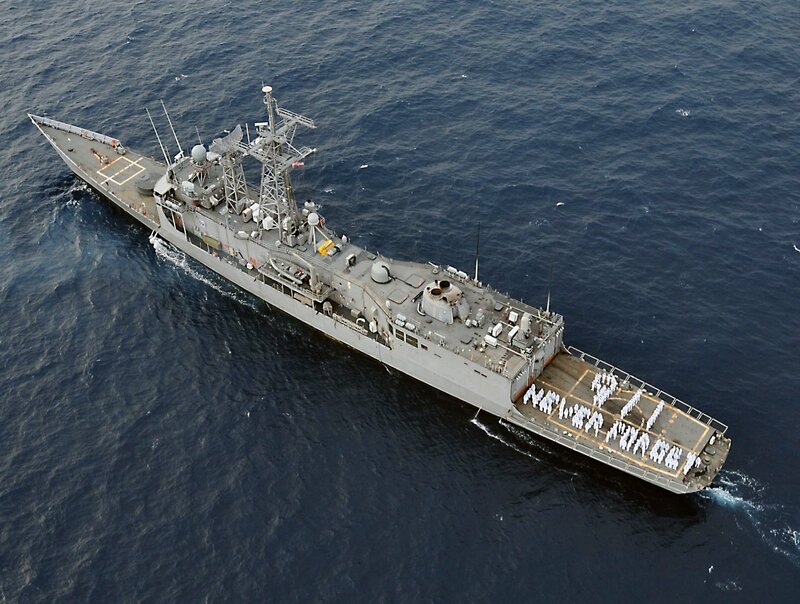 55k 16 May 2003: Naval Station Mayport, Fla. - Klakring�s name board and missile launcher, taken during a visit by the USS Allen M. Sumner (DD 692) Reunion Association. 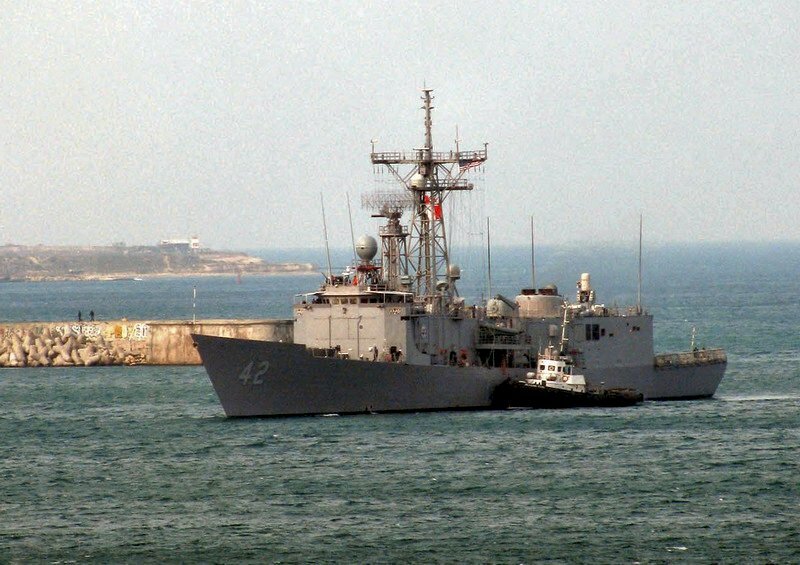 469k 18 April 2004: Souda Bay, Crete, Greece - The guided missile frigate USS Klakring (FFG 42) arrives for a brief port visit at Souda Bay. 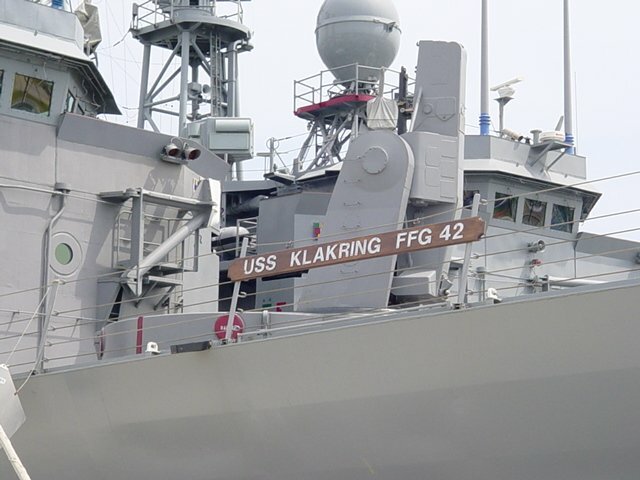 Klakring is assigned to NATO's Immediate Reaction Force, Standing Naval Force Atlantic (STANAVFORLANT) operating in the Eastern Mediterranean under Operation Active Endeavor. 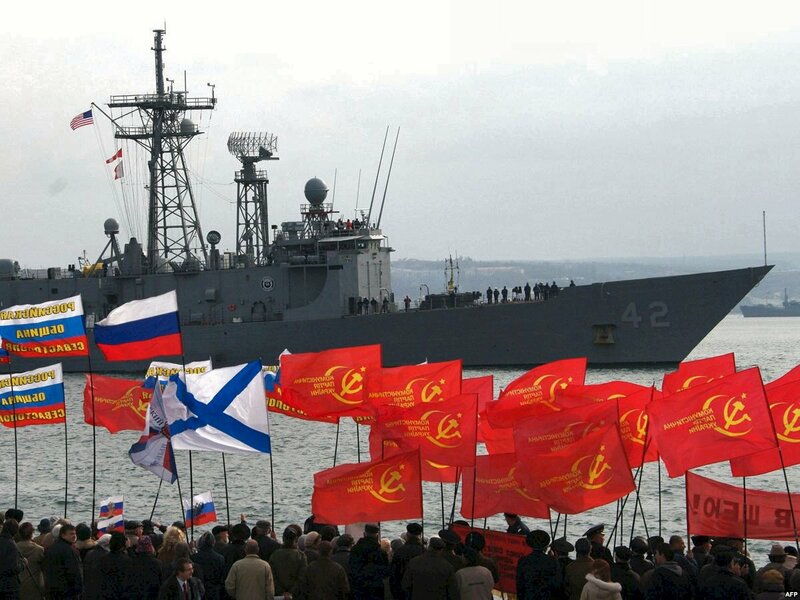 The force is NATO's maritime contribution to the fight against international terrorism. The Operation includes the compliant boarding of suspect vessels. 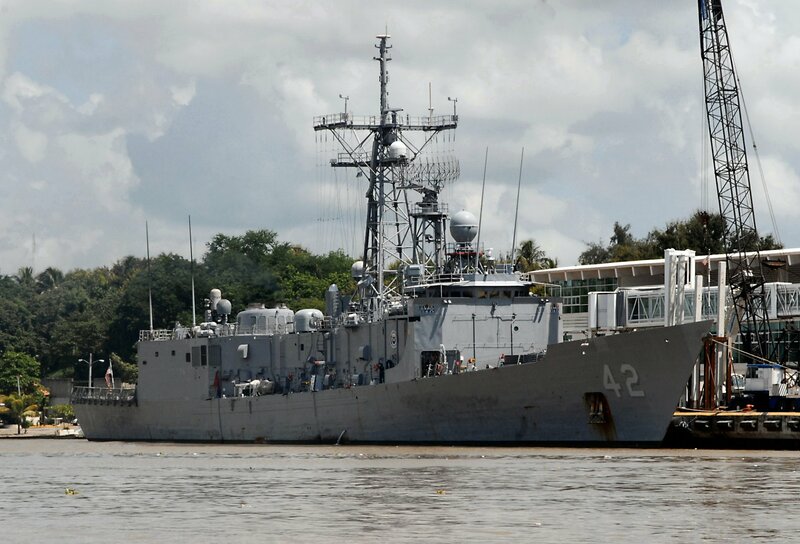 Klakring is homeported in Mayport, Florida and is the 33rd Oliver Hazard Perry-class guided missile frigate. 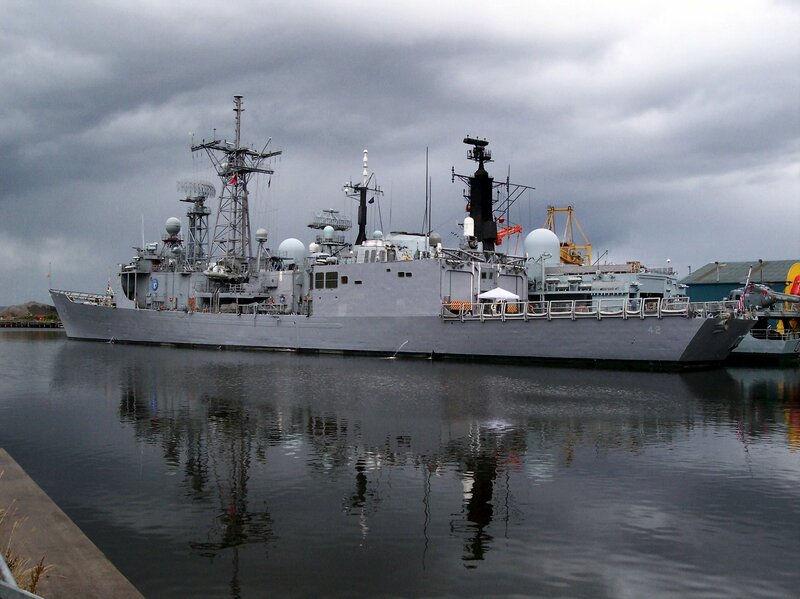 590k 19 June 2004: Leith, Edinburgh, Scotland - The crew of guided missile frigate USS Klakring (FFG 42) takes a few days of rest and relaxation before heading North of Scotland to take part in a Joint Maritime Exercise. 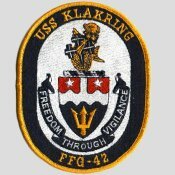 Klakring joins a British Royal Navy destroyer, USS Enterprise (CVN 65), guided missile cruiser USS Gettysburg (CG 64), fast attack submarine USS Miami (SSN 755) and fast combat support ship USS Detroit (AOE 4) as the North Atlantic Treaty Organization contribution to the upcoming exercise. 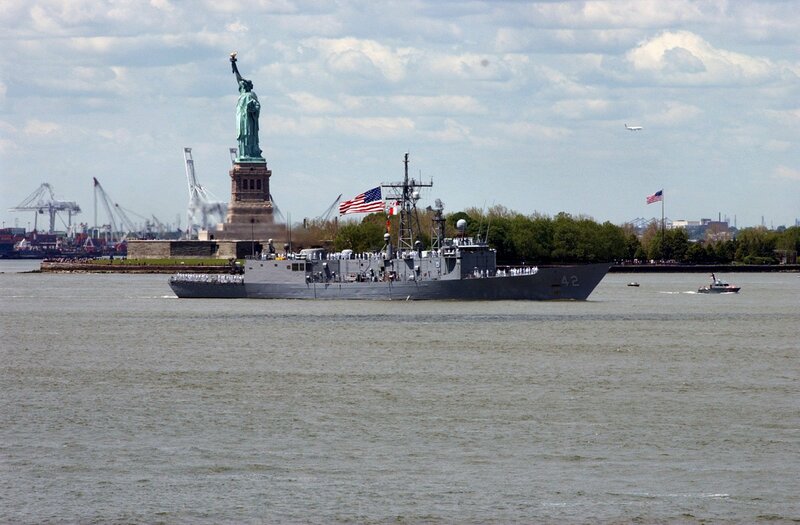 350 24 May 2006: New York Harbor, N.Y. - The guided missile frigate USS Klakring (FFG 42) sails pass the Statue of Liberty in New York Harbor, headed for a Manhattan pier to participate in the 19th Annual Fleet Week New York City. 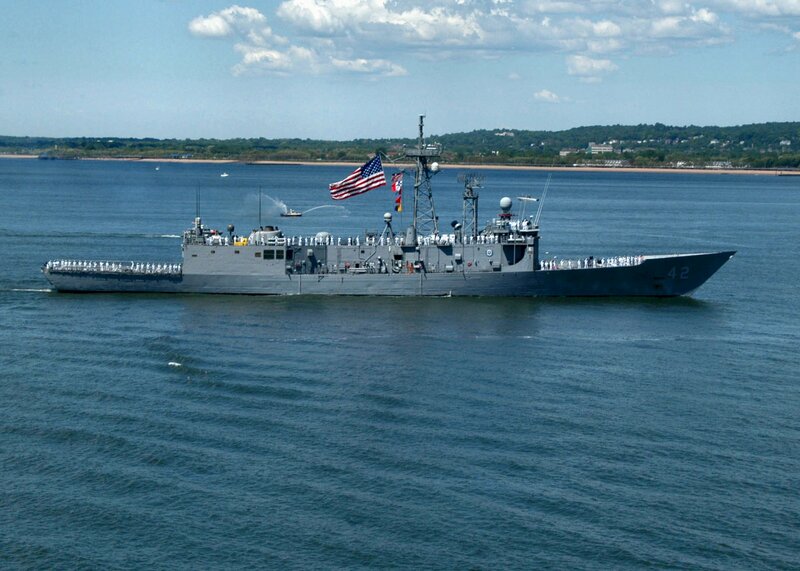 Fleet Week has been sponsored by New York City since 1984 in celebration of the United States sea service. The annual event also provides an opportunity for citizens of New York City and the surrounding Tri-State area to meet Sailors, and Marines, as well as witness first hand the latest capabilities of today's Navy and Marine Corps team. Fleet week includes dozens of military demonstrations and displays, including public tours of many of the participating ships. 364k 24 May 2006: New York Harbor, N.Y. - The guided missile frigate USS Klakring (FFG 42), passes port side of the amphibious assault ship USS Kearsarge (LHD 3) while entering New York Harbor during the parade of ships, Fleet New York Week 2006. 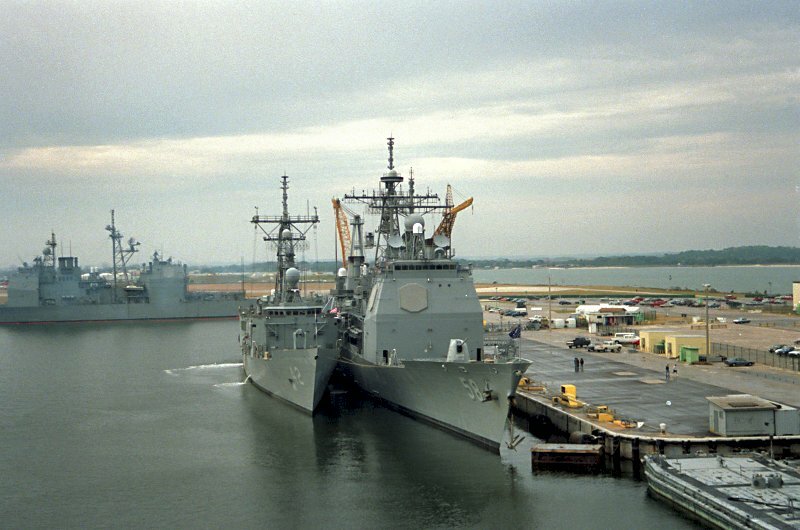 Fleet Week has been sponsored by New York City since 1984 in celebration of the United States sea service. The annual event also provides an opportunity for citizens of New York City and the surrounding Tri-State area to meet Sailors, and Marines, as well as witness first hand the latest capabilities of today's Navy and Marine Corps team. 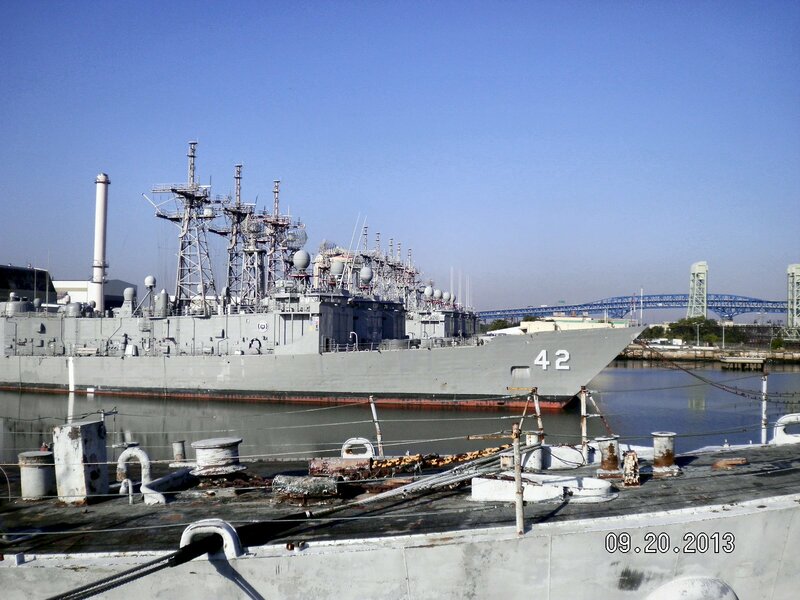 Fleet week includes dozens of military demonstrations and displays, including public tours of many of the participating ships. 311k 24 May 2006: New York Harbor, N.Y. - The guided missile frigate USS Klakring (FFG 42) passes port side of the amphibious assault ship USS Kearsarge (LHD 3) while entering New York Harbor during the parade of ships, Fleet New York Week 2006. 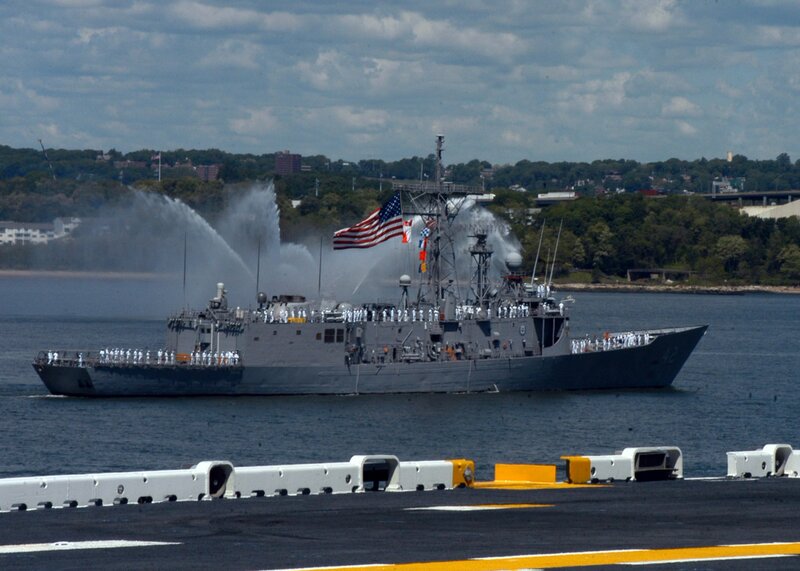 Fleet Week has been sponsored by New York City since 1984 in celebration of the United States sea service. 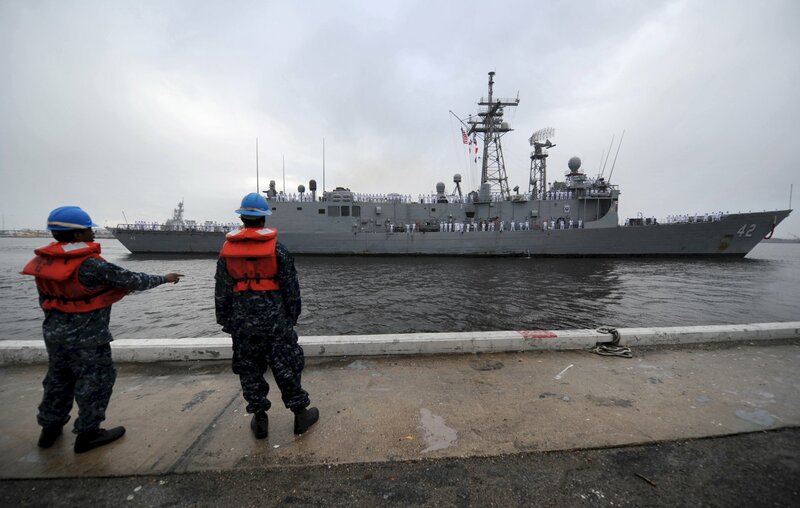 The annual event also provides an opportunity for citizens of New York City and the surrounding Tri-State area to meet Sailors, and Marines, as well as witness first hand the latest capabilities of today�s Navy and Marine Corps team. Fleet week includes dozens of military demonstrations and displays, including public tours of many of the participating ships. 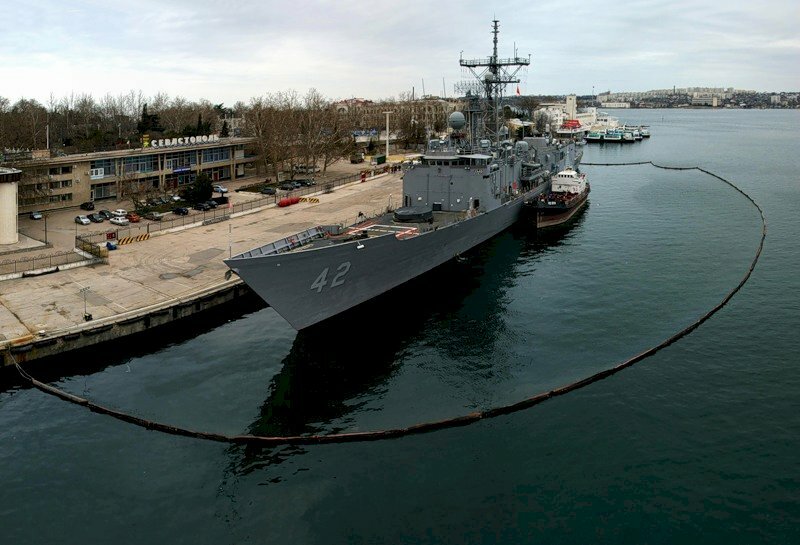 200k 17 March 2009: Souda Bay, Greece - Sailors aboard Klakring and USS Robert G. Bradley (FFG 49) conduct morning colors during a routine port visit to Souda Bay. 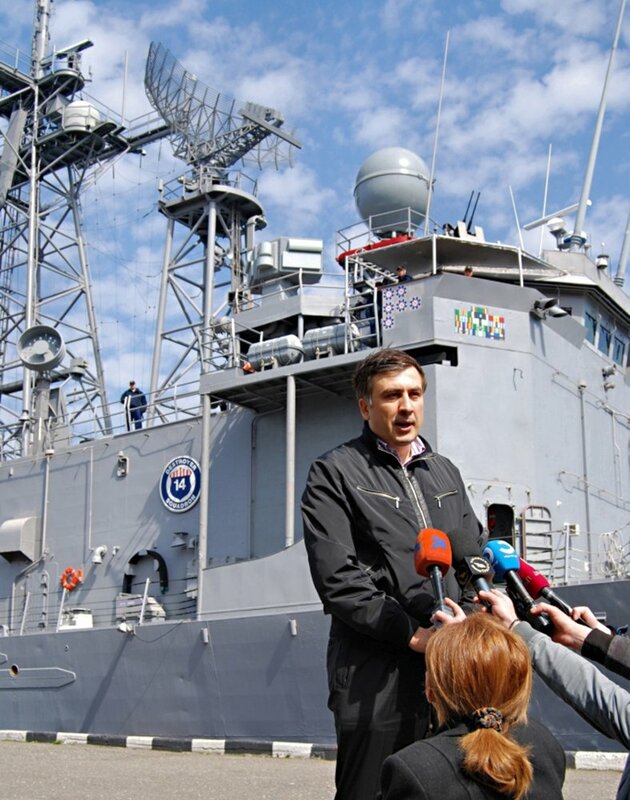 157k 02 April 2009: Batumi, Republic of Georgia - President of the Republic of Georgia Mikheil Saakashvili is interviewed by local media after a luncheon aboard the guided-missile frigate USS Klakring (FFG 42). During the luncheon, Saakashvili thanked the crew for their hospitality and discussed the strong relationship between the United States and the Republic of Georgia. 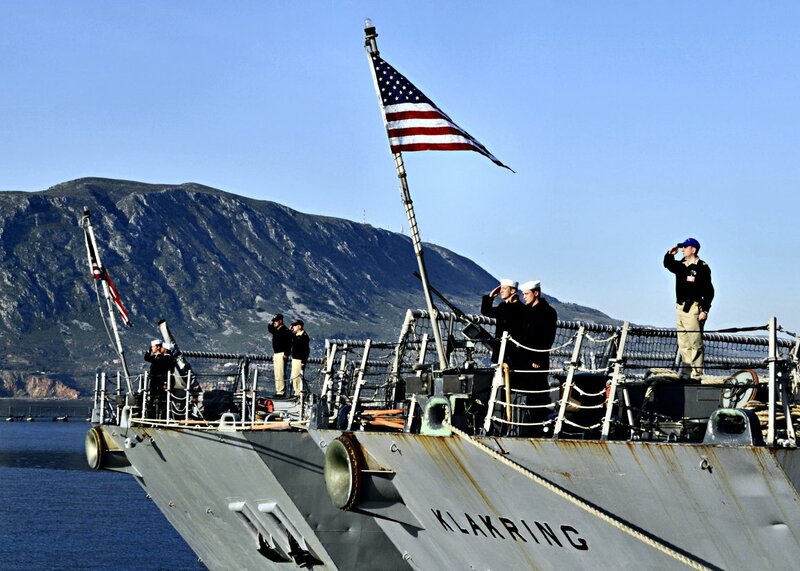 Klakring is on a scheduled deployment in the U.S. 6th Fleet area of responsibility conducting theater security cooperation engagements with regional nations. 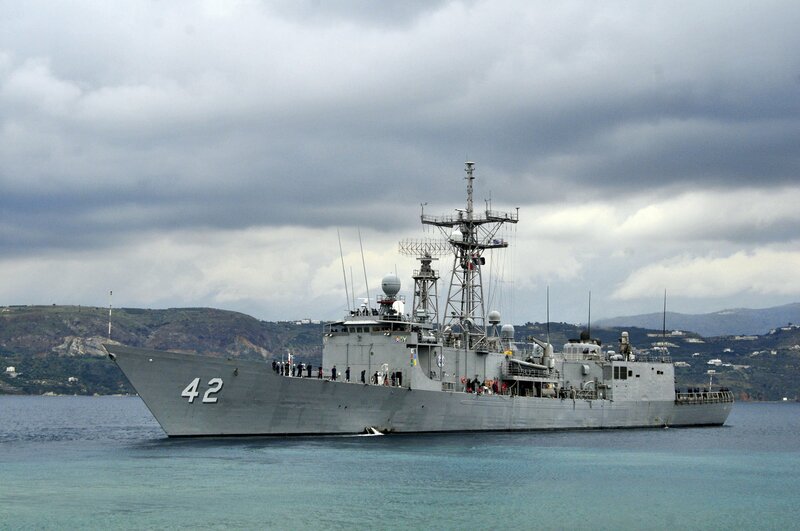 334k 04 June 2009: Souda Bay, Greece - The Oliver Hazard Perry-class frigate USS Klakring (FFG 42) arrives alongside the Ticonderoga-class guided-missile cruiser USS Anzio (CG 68) at Souda Bay. Klakring and Anzio are both conducting routine port visits. 483k 11 April 2010: St. Lucia - Damage Controlmen aboard Klakring conduct hose handling drills with crewmembers in St. Lucia. Klakring is on a six-month deployment to Latin America and the Caribbean as part of Southern Seas 2010, a U.S. Southern Command-directed operation that provides U.S. and international forces the opportunity to operate in a multi-national environment. 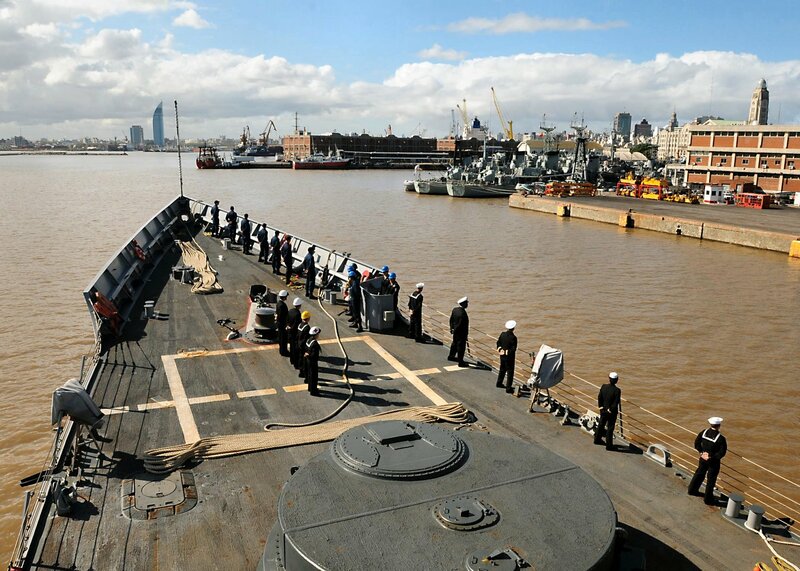 489k 07 May 2010: Montevideo, Uruguay - Sailors man the rails as Klakring pulls into port in Montevideo, Uruguay while on her Southern Seas 2010 deployment. Southern Seas is a U.S. Southern Command-directed operation that provides U.S. and international forces the opportunity to operate in a multi-national environment. 382k 18 May 2010: the Atlantic Ocean - Klakring prepares to transfer sailors on a rigid-hull inflatable boat for cross deck exchanges during the UNITAS LANT multi-national naval exercise. Klakring is on a six-month deployment to Latin America and the Caribbean as part of Southern Seas 2010, a U.S. Southern Command-directed operation that provides U.S. and international forces the opportunity to operate in a multi-national environment. 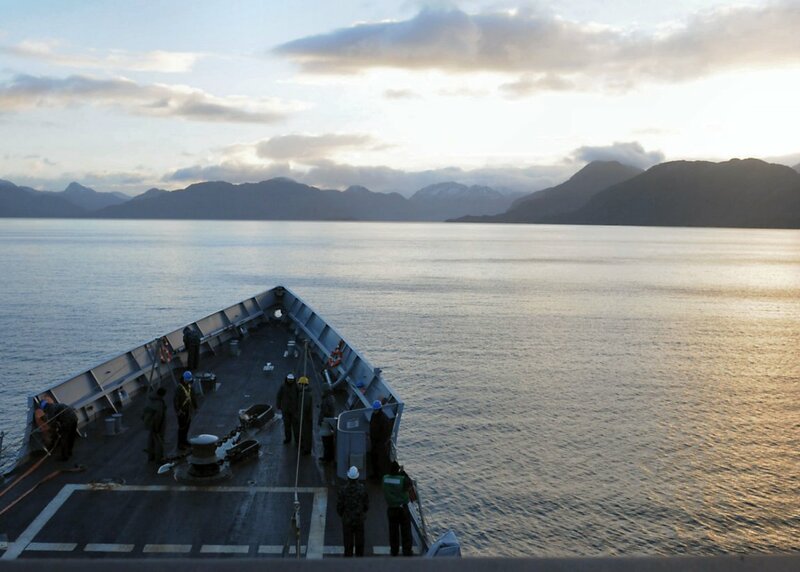 135k 06 June 2010: the Straits of Magellan - Sailors aboard Klakring work on the foc'sle while transiting the Strait of Magellan during a six-month 2010 Southern Seas deployment. Southern Seas is a U.S. Southern Command-directed operation that provides U.S. and international forces the opportunity to operate in a multi-national environment. 404k 28 June 2010: the Pacific Ocean - Klakring cruises in the Pacific Ocean. Klakring is on a six-month deployment to Latin America and the Caribbean as part of Southern Seas 2010, a U.S. Southern Command-directed operation that provides U.S. and international forces the opportunity to operate in a multi-national environment. 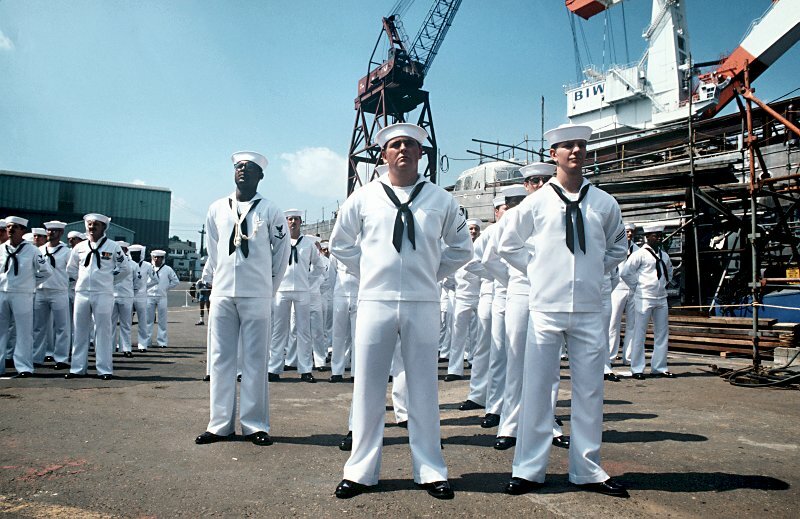 413k 11 September 2010: the Caribbean Sea - Sailors on the flight deck of Klakring stand in formation during a moment of remembrance to honor the victims of the Sept. 11, 2001 terrorist attacks. Klakring is on a six-month deployment to South America and the Caribbean as part of Southern Seas 2010, a U.S. Southern Command-directed operation that provides U.S. and international forces the opportunity to operate in a multi-national environment. 411k 14 September 2010: Santo Domingo, Dominican Republic - Klakring is moored in Santo Domingo, Dominican Republic. Klakring is deployed supporting Southern Partnership Station 2010, a deployment of various specialty platforms to the U.S. Southern Command (USSOUTHCOM) area of responsibility in the Caribbean and Central America. 439k 29 September 2010: St. Johns River, Fla. - Klakring returns to Naval Station Mayport after a successful six-month deployment to the Caribbean, Central and South America supporting Southern Seas 2010, a U.S. Southern Command-directed operation that provides U.S. and international forces the opportunity to operate in a multi-national environment. 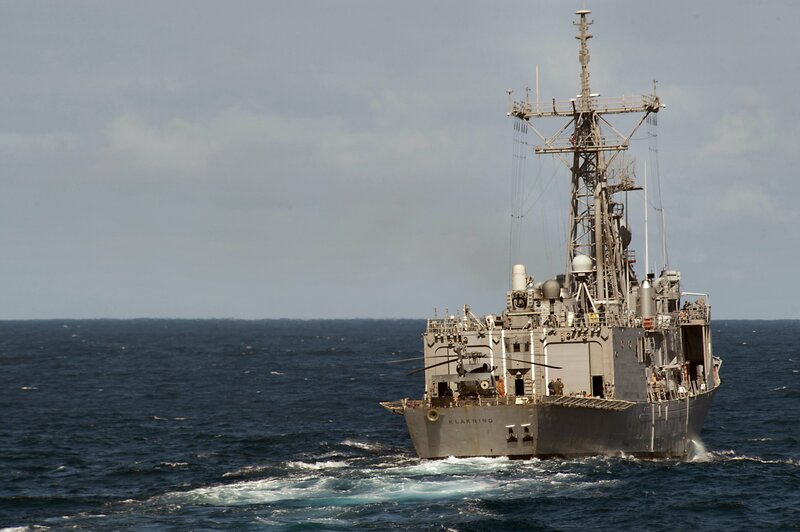 Southern Seas focuses on working with partner nations in the region conducting exercises, military-to-military engagements, and theater security cooperation engagements to enhance interoperability. 542k 16 November 2012: Mediterranean Sea - The guided-missile frigate Klakring departs Souda Bay, Greece following a port visit. 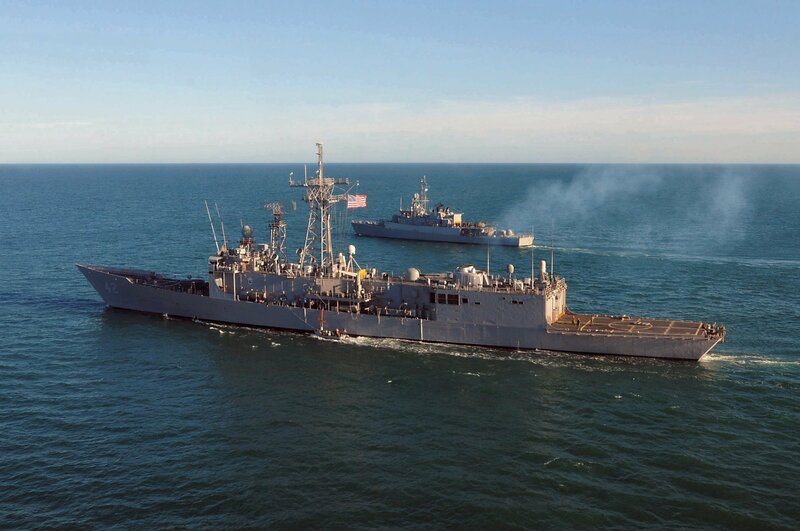 Klakring, homeported at Mayport, Fla., is deployed conducting maritime security operations and theater security cooperation efforts in the U.S. 6th Fleet area of responsibility. 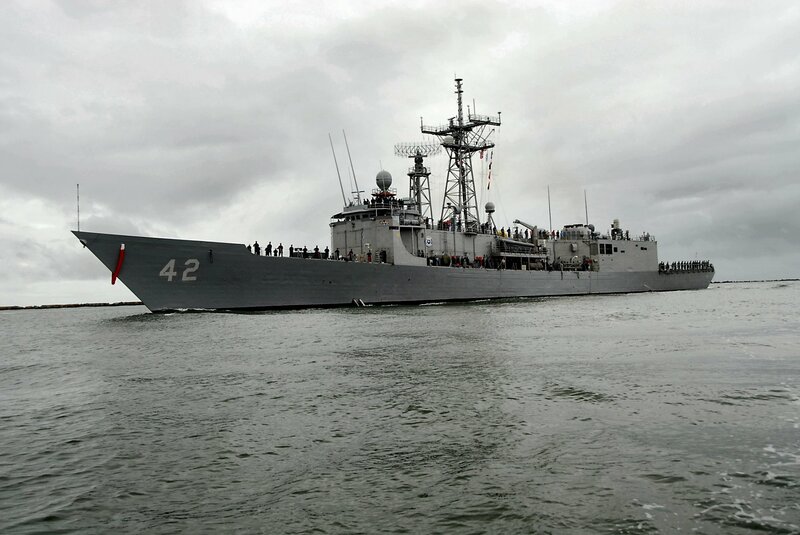 342k 01 December 2012: Mayport, Fla. - The guided-missile frigate Klakring returns to its homeport of Naval Station Mayport after a six-month deployment to the Caribbean Sea and eastern coast of South America. 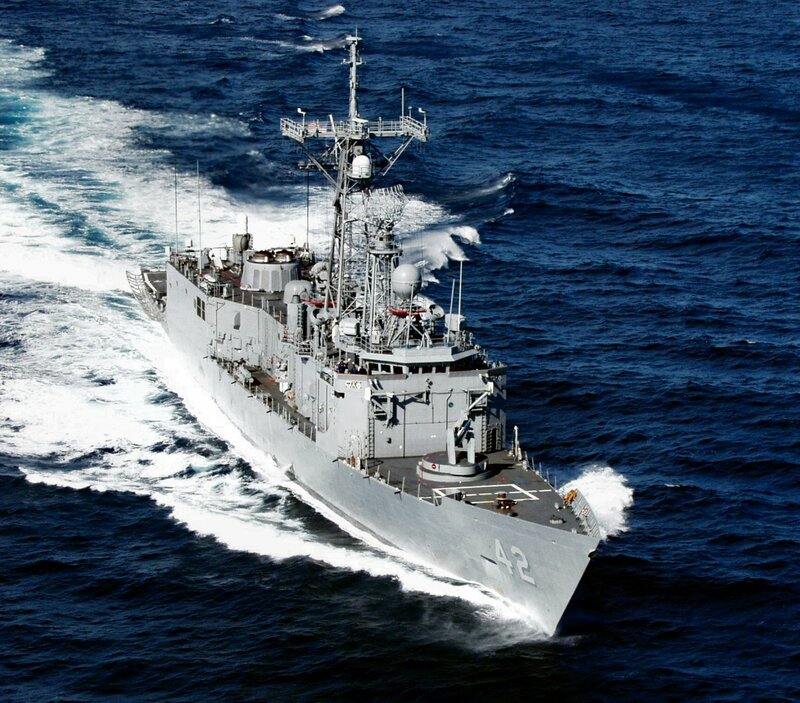 Klakring participated in intelligence surveillance reconnaissance in support of anti-piracy operations utilizing Fire Scout, an unmanned aerial vehicle. 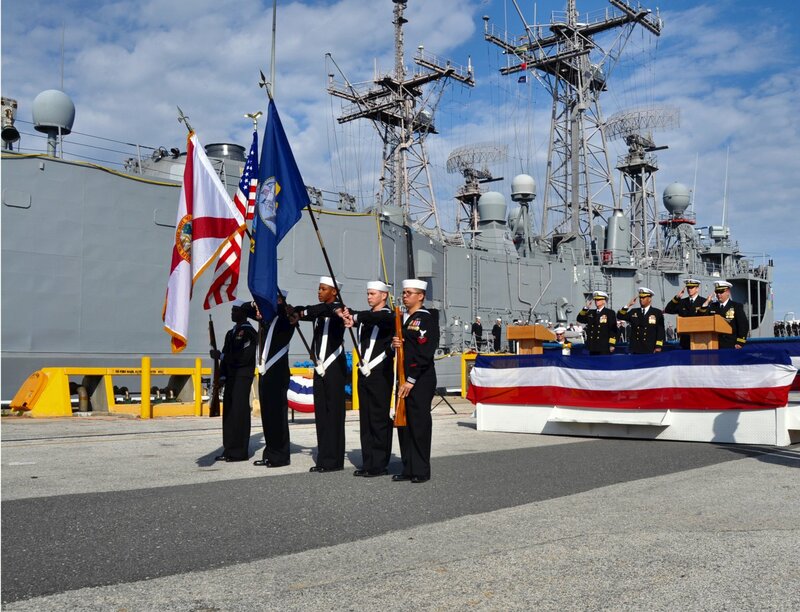 397k 22 March 2013: Mayport, Fla. - The color guard presents the colors as the official party salutes during a decommissioning ceremony of the guided-missile frigate USS Klakring (FFG 42). 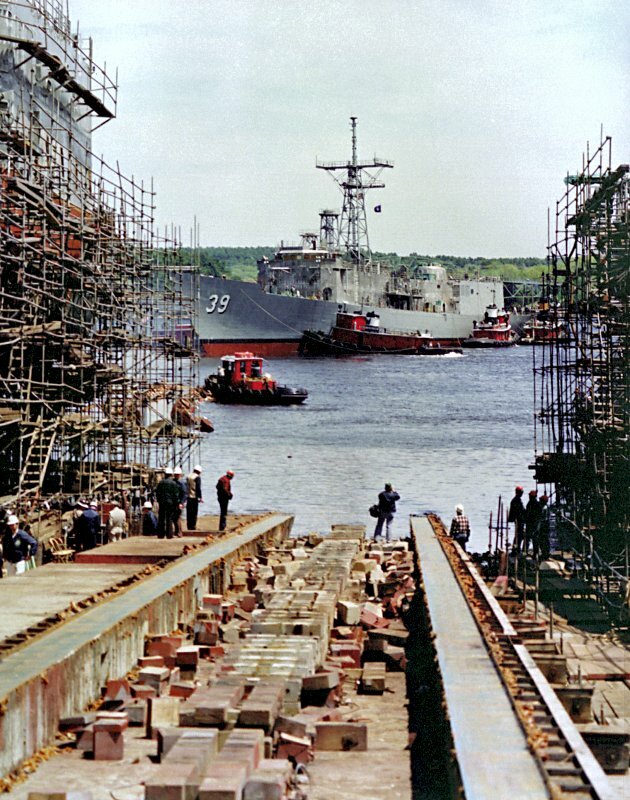 Klakring is being decommissioned after 29 years of service aboard Naval Station Mayport. 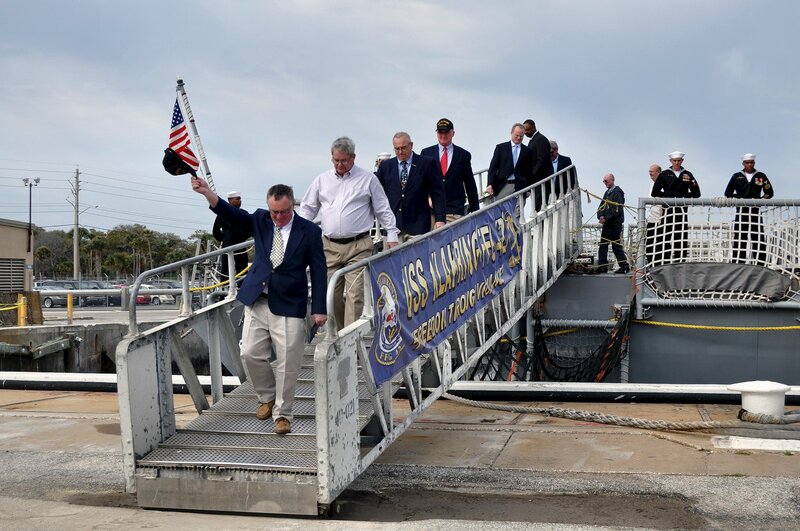 364k 22 March 2013: Mayport, Fla. - Plankowners from the first crew of Klakring walk off the ship for the last time during its decommissioning ceremony. 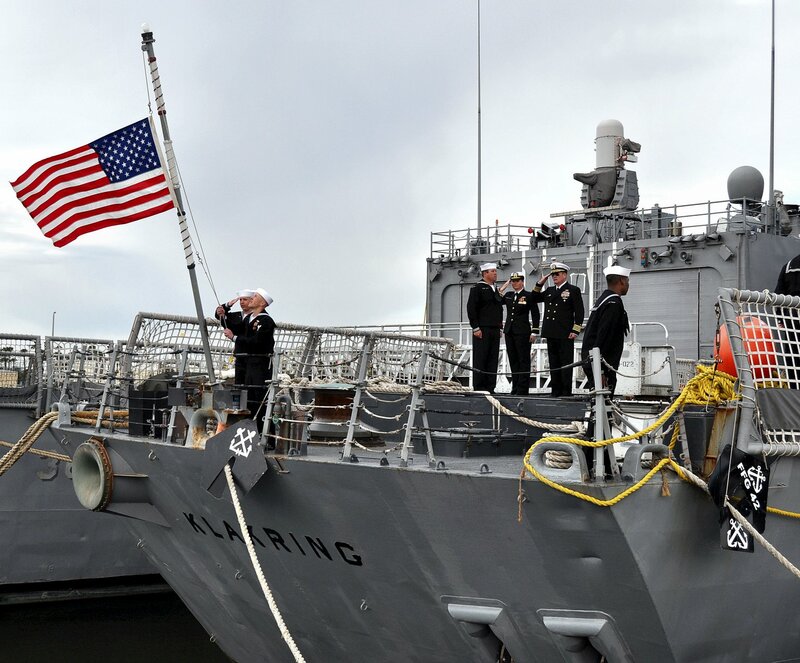 384k 22 March 2013: Mayport, Fla. - Sailors salute the ensign as it is lowered on the fantail of the guided-missile frigate USS Klakring (FFG 42). 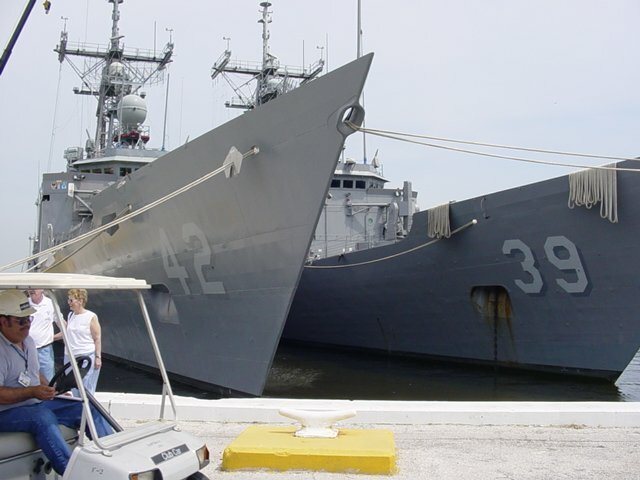 Klakring is being decommissioned at Naval Station Mayport after 29 years of service. 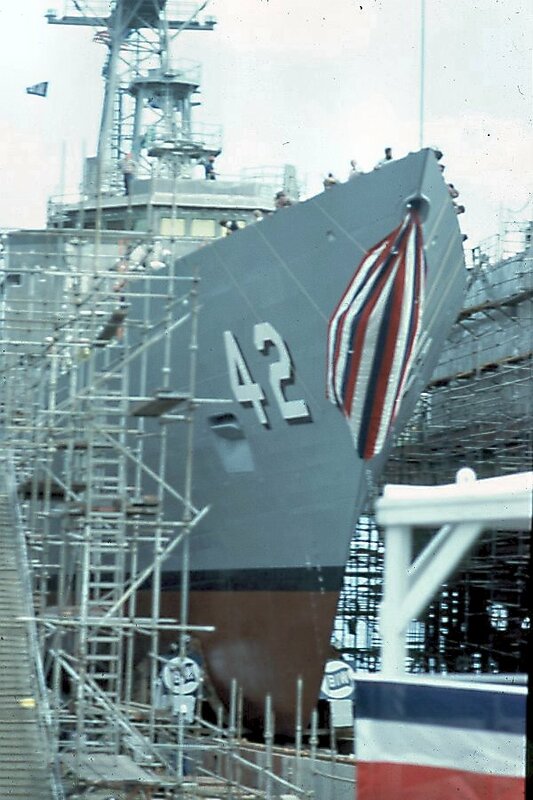 View the USS Klakring (FFG 42) DANFS history entry located on the Naval History and Heritage Command web site. 10.) 16 Jun. 2000 - 17 May 2002 Cmdr. Stephen Fairbank Davis, Jr.